Macy’s Friends and Family Sale started today! With code FRIEND, you’ll receive 15% off beauty and 30% off other items in the store. The sale runs through December 10. Generally the F&F sales have a bit fewer exclusions than their normal sales. Shipping is free with any beauty purchase. Also new is a Clinique Festive Favorites Set worth $198 and includes 6 full size products and 4 minis. Available for $49.50 with any $29.50 Clinique purchase. This set includes the following products: Rinse-Off Foaming Cleanser, Dramatically Different Moisturizing Lotion+, Deep Comfort Hand & Cuticle Cream, Smart Night Moisturizer, Chubby Stick Intense in Broadest Berry, High Impact Lash Elevating Mascara, Take The Day Off Makeup Remover, Moisture Surge Supercharged Concentrate, Chubby Cheek in Roly Poly Rosy, and Quickliner for Eyes Intense in Intense Black. Macys.com has 7-Piece Clinique Discovery Set + $10 Bounce Back Card on sale for $15. Shipping is free. Clinique Bonus Time at Nordstrom, Macy’s and Saks! It has been pouring rain today and apparently it is also raining Clinique Beauty Bonuses! Haha! There are THREE separate Clinique free gift with purchase offers happening right now. 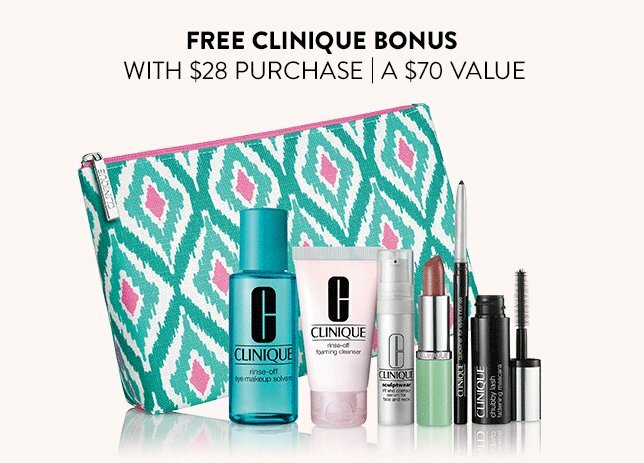 I previously wrote about the Clinique free gift with purchase here, but to recap, you’ll get a free 7-piece bonus with a $28 Clinique purchase valued at $75. There are also step up gifts at $55 and $70. The Macy’s offer is also a free 7-piece gift with $28 Clinique purchase. It is also packaged in a Jonathan Adler designed cosmetics bag, but the contents differ slightly. The gift is valued at $75. 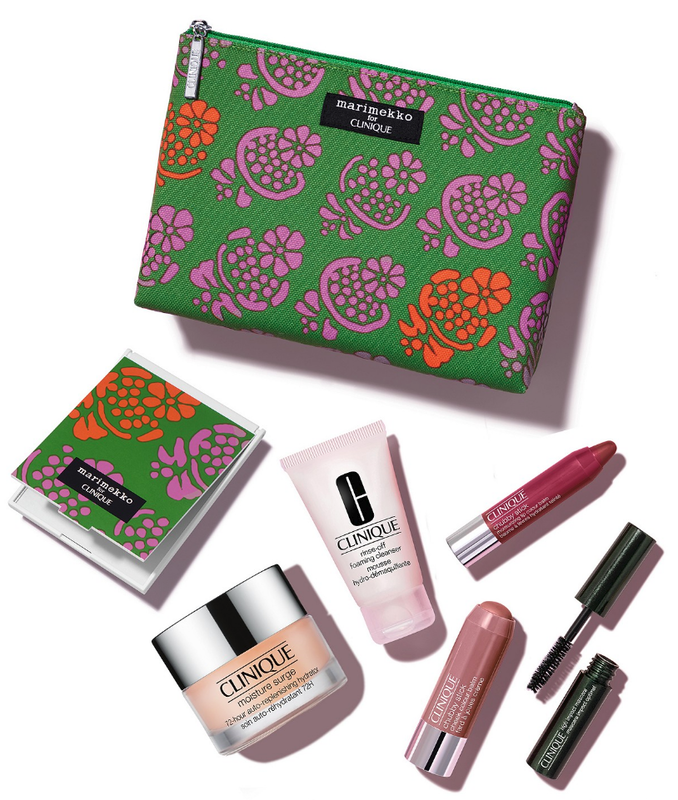 The Saks offer is a free 7-piece gift with $40 Clinique purchase. Use code CLINIQ6A. There’s also a step up gift at the $65 level. Spend $65 on Clinique and also receive a bonus 1 oz Smart Night Custom-Repair Moisturizer when you enter code CLINIQ6B at checkout, while supplies last. You can enter up to five codes when you checkout at Saks, so be sure to combine with any freebie codes you see here that would apply to your order (look for “gift with any beauty or fragrance purchase”), plus you can enter code FREESHIP at checkout to receive free shipping. Another Clinique Bonus Time at Nordstrom has started! Online and in store while supplies last with any $28 Clinique purchase you will receive this free seven piece gift valued at $75. There’s also 2 levels of step up gifts! Bonus: Spend $50 on beauty (any brand) and receive a free sampler when you enter one of these codes at checkout: LIGHT, MEDIUM, or DARK, while supplies last. As always with Nordstrom, all orders ship free (and returns are also free) and you’ll receive 3 small samples with any beauty purchase. Lord and Taylor is holding another Friends and Family Sale, which means they are taking 15% off your entire beauty purchase! As part of the Friends and Family sale, Clinique is offering a new gift with purchase designed by Jonathan Adler. 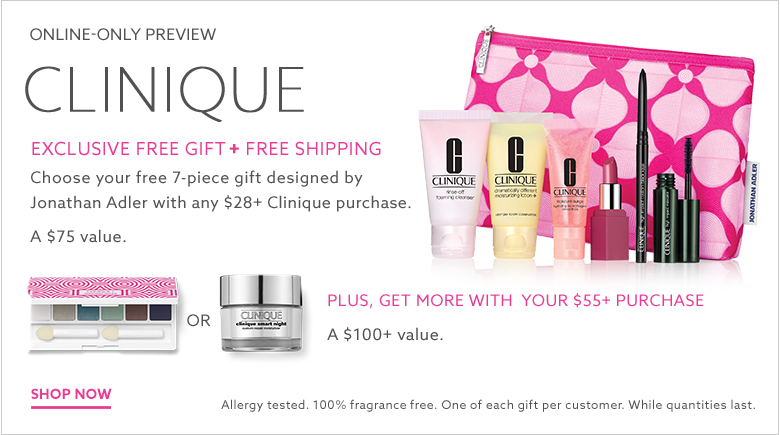 With your $28+ Clinique purchase, receive a 7-piece free gift with purchase, valued at $75. 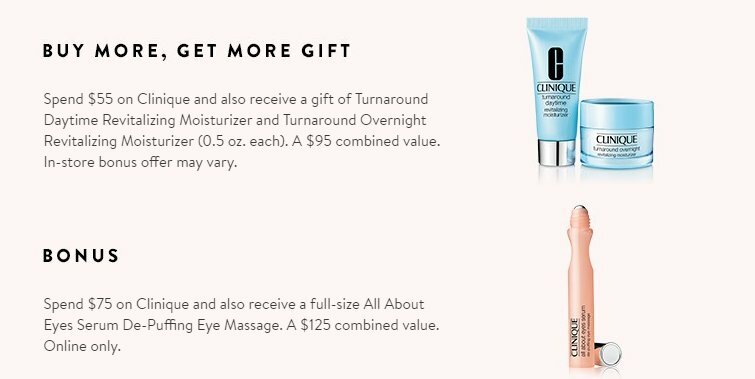 Clinique has a new beauty bonus available at Nordstrom. 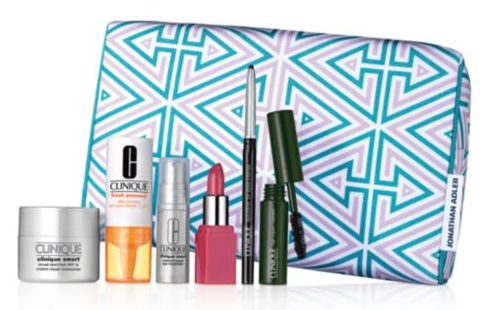 Receive a free seven piece gift with $28 Clinique purchase at Nordstrom. Available online and in stores. There’s also a step up gift at $55 and $75! At the $55 spending level, you’ll also receive a gift of Turnaround Daytime Revitalizing Moisturizer and Turnaround Overnight Revitalizing Moisturizer (0.5 oz each). A $95 combined gift value. Nordstrom says the in store gift may vary. At the $75 spending level, you’ll receive a full-size All About Eyes Serum De-Puffing Eye Massage. A $125 combined gift value. This gift is online only.